I said I was going to come back and post some good news. My news is not the best it could be, but it is still great! We traveled to Cedarville early Saturday morning for a AMC Conference showdown. Just a quick rundown of some AMC history: Malone has won this meet 17 years in a row, and that number is more but they were not in the AMC for two years in the early 90's. They have won a total of like 47 times! Shawnee State only finished 2nd once, in 2005, and has finished 3rd the past 3 years. 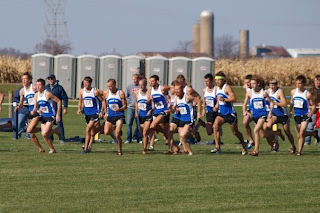 My freshman year we were upset by Cedarville by one point and was denied a Nationals trip. Last year we lost to Cedarville again but was granted a bid to Nationals. So, there is a lot riding on this meet. This is also the last year we are in the AMC. Next year, Shawnee is moving to the Mid South Conference, where we could become the next Malone of that conference and win titles every year. Our Ultimate goal was to beat Malone. Some people might say it is foolish to think we could beat the last two defending Nationals Champions and the Number 1 ranked team in the nation, but, what did we have to lose? We were not being cocky about it. There was no other goal to make for this meet. We were the clear cut second best team in the race, and if our goal was to just finish second, our chances of slipping to third would have been greater. So, we aimed high and the worst we could do was finish second. Our box was right beside Malone's so right away we could get a good feel of how they were going to race us. 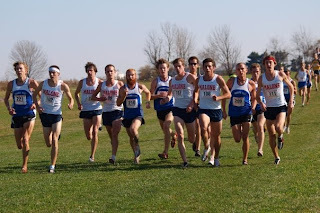 It ended up being a relaxed start; it was just Malone, Shawnee, a few Cedarville guys, and a few other individuals up front. The first mile was slow. I could tell Malone was trying to slow it down and just make sure we were right there. They were not opening the race up early, that is for sure. I thought it was strange how all the Malone guys were saying stuff to each other and turning around looking for their teammates and tugging on each others jerseys to signal something. I don't know if they were trying to psych us out or if they always do that, but I just kept focused and stayed with the pack. The race was still packed up after 2 miles and no one tried to break open the race (except for a Houghton guy, and it didn't last long). 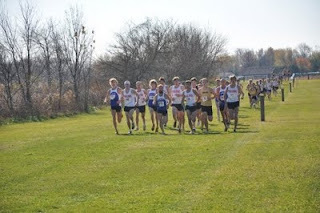 The previous two pictures indicate how the race was for the first two miles. I do have to add another note about this race. Even though the weather was perfect, 60 degrees, clear sky, dry ground, it was very windy. Look closely at our hair, it is swept to the left in the third picture. Forecast said 20 mph wind, so we were all trying to tuck in. Anyways, the race went on and it soon went from a casual pace, to a grueling pace due to one key move. The key move came at about 2.5 miles and it came from T.J. Badertscher of Cedarville. He simply decided to surge past the front group and get the race rolling, and it worked. Zeuch and Melhorn from Malone followed and Corey and I tried to hang on, as did the rest of Malone and our guys. At 3 miles, it was very strung out and Malone had 2 guys in front of me! I was in about 5th place or so, but Malone started pressing. About 3 of their guys passed me and I could not respond. 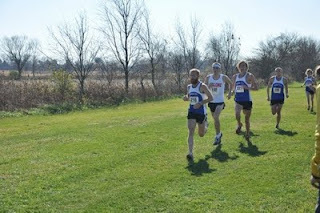 Another Cedarville guy passed me; Galen also moved by me and I was trying really hard to hold on. So, the race became a race and people started getting in their position. At mile 4, this is how it stood. 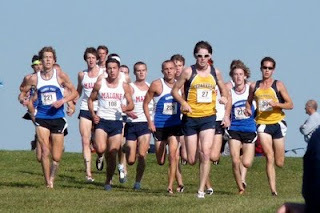 Tj, 5 Malone guys, another Cedarville guy, and Galen were all ahead of me. I was running beside Nick Meeson from Malone, their 6 man. Things did not look good! That is about how the race ended up. The last mile was very fast but there was not a lot of movement in places. Melhorn ended up beating Tj by 15 seconds, Tj still got second. It was a nice showing for him at his home course and he really did make the race. After him, was 4 more Malone guys, so they put 5 in front of our 1. We need to run with them! Evan Thayer was next, followed by Galen, Linkous, Meeson, and then me. I got 11th. After me, was Malones 7th man and then it was our #4, 5, 6, 7, and 8 man, which was: Shane, Corey, Chuck, Tyler, and Hornick. So, we had a good race but not a great race. We still finished 2nd, but Cedarville put 2 guys in front of our 1. A great positive is that we had 8 guys in the top 17 of the race. Even Malone can't say they did that! But, I give it to Malone for putting 5 guys in front of our one, and 6 in front of our 3, me. The time were a little slow, I ran 26:08, but like I said, it was windy and a slow start. After looking back, I wish I would have just responded to Tj's surge or else made the move myself. We, as a team could have made a huge surge and then the race could have turned out differently. There are a lot of could of would of's in every race. That is how it happened and no one can change it. We are going to Nationals and we need to do work there. It is not over!